Dash Core Team CEO Ryan Taylor - What's Next For Dash Pay? 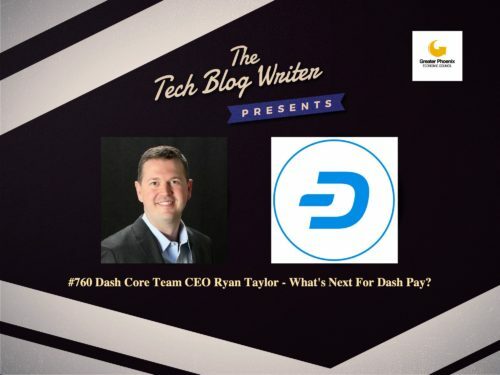 760: Dash Core Team CEO Ryan Taylor – What’s Next For Dash Pay? The Greater Phoenix Economic Council (GPEC) is encouraging companies to start or relocate to Phoenix by welcoming businesses working with emerging technologies such as driverless vehicles, wearables, industry 4.0, cybersecurity and blockchain. During my time in the Grand Canyon state, I wanted to find out more about this digital transformation from the companies enjoying success in the region. Blockchain technology companies in Greater Phoenix have found success and security while innovating in this emerging technology sector and educational institutions are producing the workforce to support its expansive growth. With Arizona State University giving students an opportunity to get hands-on experience with blockchain, it should of no surprise that this emerging technology is transforming the landscape of the region. One huge success story is Dash. Dash is an open-source project that delivers safe decentralized financial solutions. The Dash Project Team builds and maintains an innovative decentralized payment network which acts as the core of an ecosystem of engaged consumers, merchants, and service providers. This network provides users with a private, fast, and fungible digital currency that’s as easy to use as cash, credit cards or PayPal. While in town, I dropped by the Dash Core Team headquarters to speak directly with CEO, Ryan Taylor. We discuss why Phoenix is so attractive to blockchain companies and increasingly being chosen ahead of Silicon Valley. We also discuss tribalism in cryptocurrency and the future for Dash and Dash Pay. Dash recently released it’s ‘Biggest Upgrade’ Since Governance System called Dash Evolution 0.13. But, what else can we expect in 2019? Ryan Taylor reveals all. You can also find a selection of other podcast interviews with companies in the blockchain and cryptocurrency space by clicking here. If you want to gather around a virtual campfire and have a chat or ask me a question, you can message me, leave a virtual voicemail or even buy your friendly podcast host a coffee. Previous Post761: Aeternity - Can Blockchain and GDPR Be Compatible?